Time for another review! This time I’m taking a look at the Vivobarefoot Tracker FG barefoot hiking boots. The new Firm Gound sole is aimed for muddy or hard surfaces. There is also a gorgeous black leather version of the Tracker that uses the Soft Ground sole which is meant for even harsher trails. Thanks Jari I am waiting for a sale or discount to buy a pair may bite the bullet and buy at full price I have lots of vivobarefoot shoes and seem to be wearing them more and more instant mindfulness when I walk. 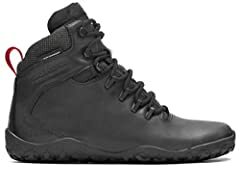 I just purchased this boot the other day, I’m definitely excited to try them out! I am intrigued by your process of maintenance with the leather. Do you have a specific process that you use? Thanks for the introduction, made my decision to by them. Can you tell something about their lasting? I’m still worried about how long they will last, they’re just too expensive for a year or two. 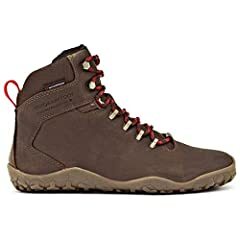 I have these ‘Vivobarefoot’ Hiking Boot and also the leather version of the ‘Lems’ Boulder Work Boot; the difference between them is that the ‘Lems’ are have no waterproofing, so you have to apply wax. However I find myself wearing the ‘Lems’ more, the reason they’re just a much better looking boot to be honest. Great review by the way! Did you change your mind? Are they reliable? Great review, thanks. I especially liked seeing one boot maintained and the other unmaintained. I thought about getting these boots, and glad that they worked out for you, but I am glad that I didn’t buy them in the end. I went with Lems Boulder boots and I really love them, but found them too warm in the summer. These Tracker boots would have been way too hot for me to use for most of the year, and I already have a warm minimalist winter boot that I am very happy with. I’ve done a few reviews of the Lems and compared them with other shoes I use for long distance wilderness hiking on my channel, if you are interested. I am happy with all my hiking shoes, but I do wish they would make a good warm weather/summer minimalist/barefoot hiking boot. If Merrell Trail Gloves came in high-tops that would be just about perfect for me. Anyhow, what shoes do you hike in during the summer? Update: I found that I might have been just lacing these boots too tighly, even though I didn’t think I was doing so. This lead to the reduced breathability. The boots fit my feet like a glove and there simply isn’t much space for air to move. Lacing the boots very lightly helps to vent out that hot air.